From 1850 through 1854, the cemetery expanded northward as the previously surveyed grounds were consumed by interments. On November 30, 1850, the Chicago Daiily Journal wrote: A neat and sufficiently spacious chapel has been erected upon the grounds by the City Sexton, and much attention and taste are displayed in beautifying the narrow domains of sleeping friends. In 1852, Chicago saw its grandest funeral to date with the death of David Kennison. In September 1854 the cemetery lot sizes were changed from 9 x 24 feet to 9 x 12 feet. A 9 x 12' lot was enough space to hold four sets of remains. Between the years 1850 and 1854, Chicago's population more than doubled, increasing from 28,620 to 70,000. 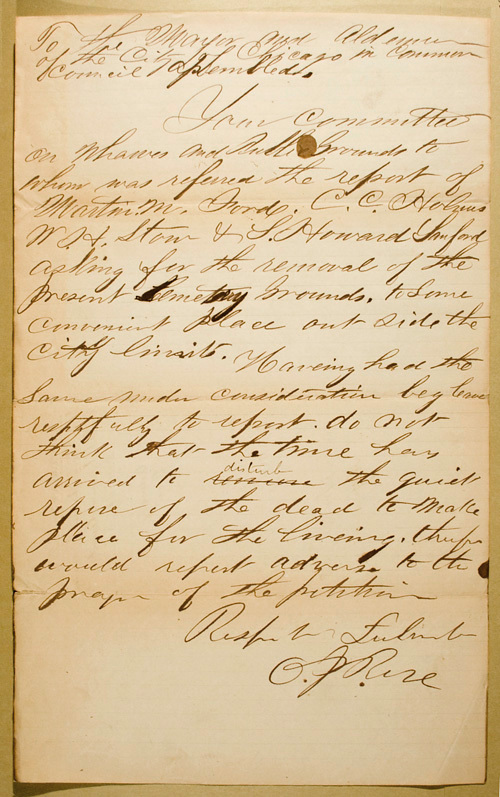 Cholera outbreaks account for the high death rates during 1850 and 1854. During six days in July, 1854 more than 200 cholera victims were buried in the Potter's Field. 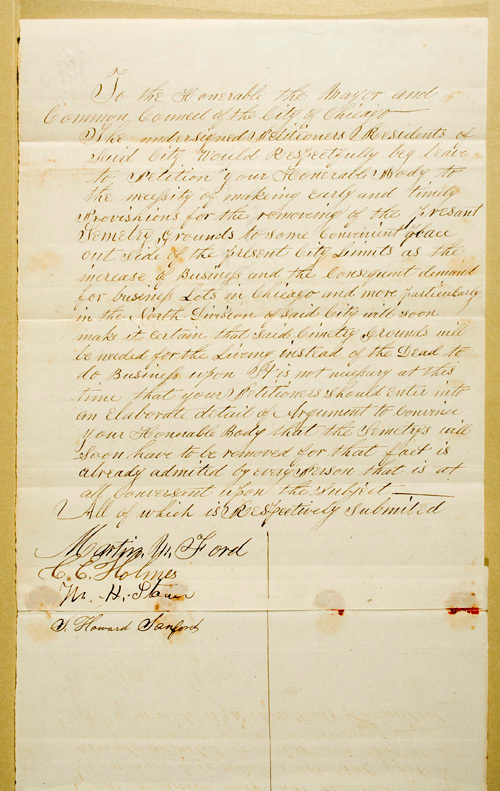 The acquisition of the 12-acre Milliman Tract was deemed, in 1865, to have been obtained illegally. By that time, the land had been surveyed and sold as 656 nine-by-twenty-four foot cemetery lots, each of which could hold up to eight bodies. The City was ordered to vacate the grounds and return the land to the Milliman heirs. 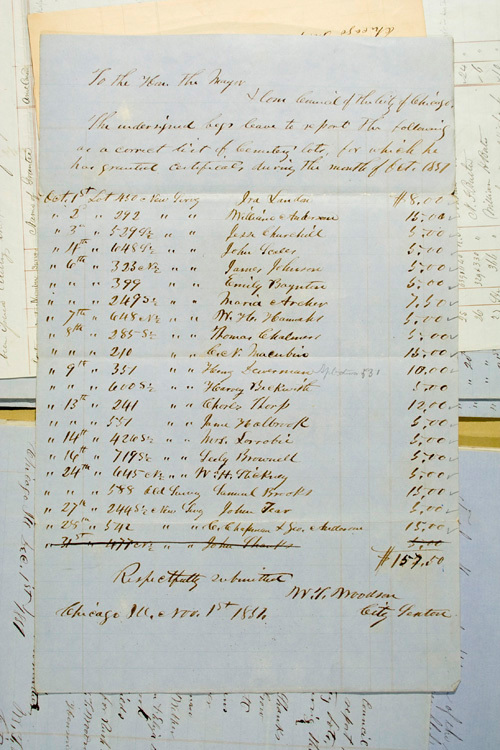 Your Committee on finance together with Wm Jones who had in charge the purchase of Blocks forty Eight and forty nine in the Canal trustees Subdivision of Section thirty three town forty range thirteen have made the purchase for twenty five hundred dollars Said blocks contain twelve acres and thirty five hundredths all which is respectfully Submitted. 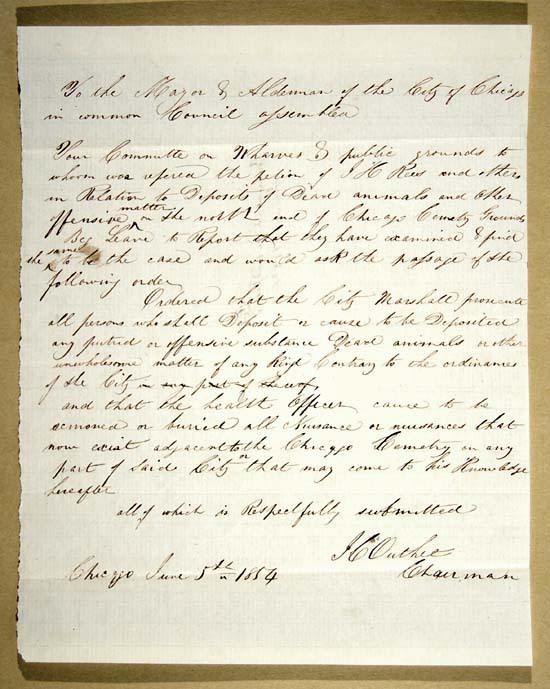 That the Mayor and Clerk execute a bond and Mortgage in behalf of the City of Chicago to Cyrus Bentley administrator of the estate of Jacob Mitteman (sic) deceased for twenty five hundred dollars payable on half in six months and one half in twelve months for the payment of Blocks forty Eight and forty nine in the Canal trustees Subdivision of Section thirty three in town forty range thirteen and that the purchase of the above mentioned land be approved ratified and confirmed. 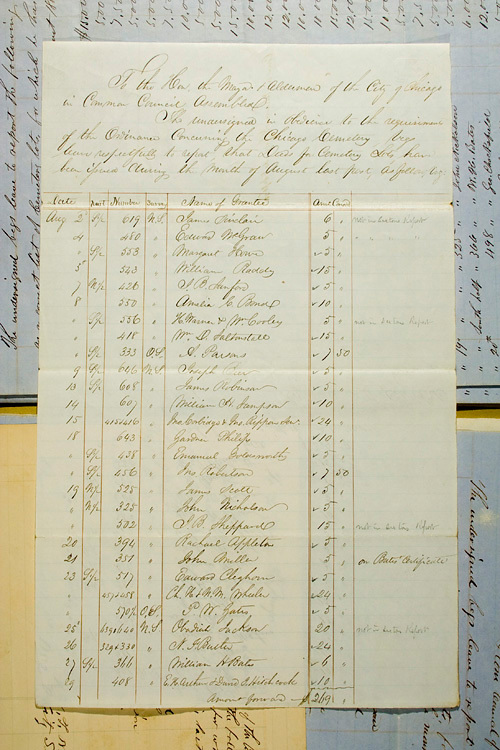 These ledger pages show the Chicago City Cemetery lots sold during the months of August and October, 1851. To the Hon the Mayor & Aldermen of the City of Chicago in Common Council Assembled. See all lot owner information transcribed in chronological order HERE. That the Clerk caution the public by advertisement in the Corporation newspaper and other papers of the city, not to purchase Lots in the City Cemetery except from the City Sexton, W.T. Woodson and also to publish a List of Lots unsold which are occupied and which have not been paid for. 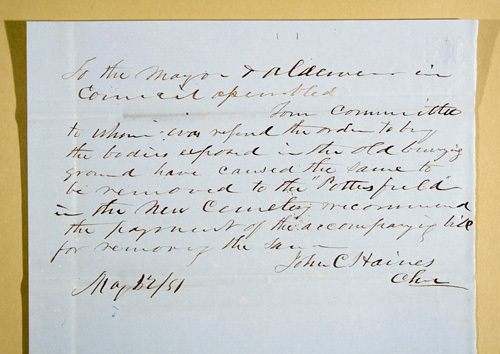 This memo indicates that coffins were becoming exposed in the earlier cemetery along the lake shore nearly ten years after that cemetery was supposedly vacated to the new City Cemetery. Later, in the Potter's Field, a section that was located nearest the lake shore in the City Cemetery, coffins which similarly became exposed were continually re-covered by the City Sexton. 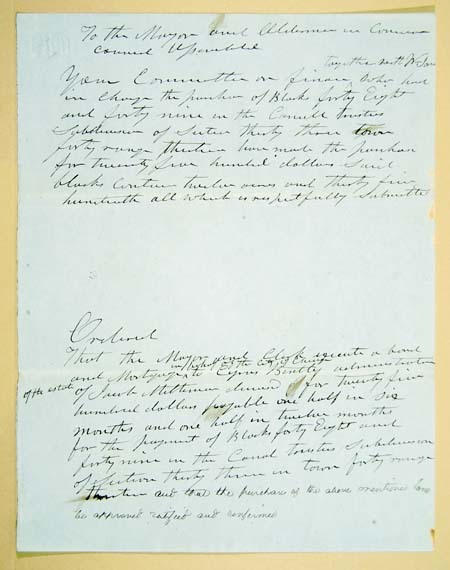 Both documents courtesy of the Illinois Regional Archives Depository. 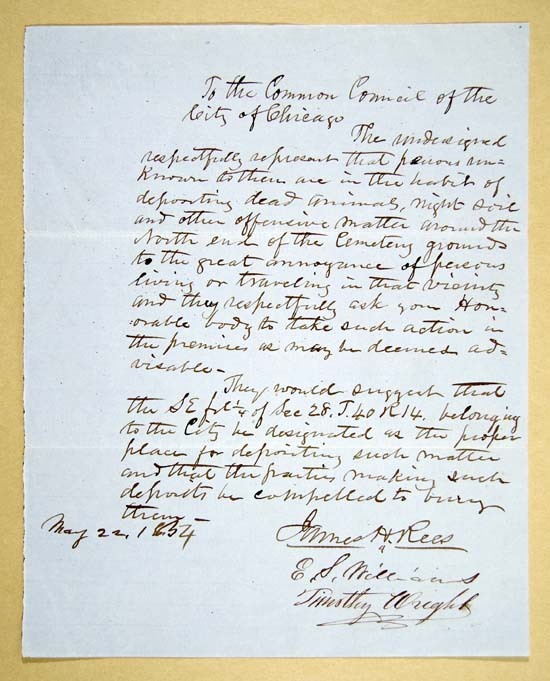 To the Mayor and Aldermen of the City of Chicago in Common Council asssembled. 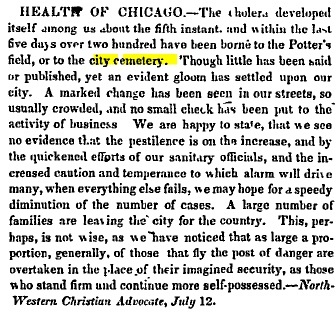 This article, from the North-Western Christian Advodate newspaper, indicates that more than 200 cholera victims were buried in the City Cemetery's potter's field during a two-week period in July 1854. The deaths occurred so rapidly that at first no accurate account could be taken of them. The interments in the first week of July were 242, in the second week 252, of these about three-fifths were credited to cholera, though there can be no doubt that the proportion was much greater. Of these 494 interments, only the names of 315 could be collected. In the remaining half of the month the deaths were 437 – total for July 931. See the entire article, as well as other information about the cholera here. See also, The Numbers section, and the Potter's Field section. 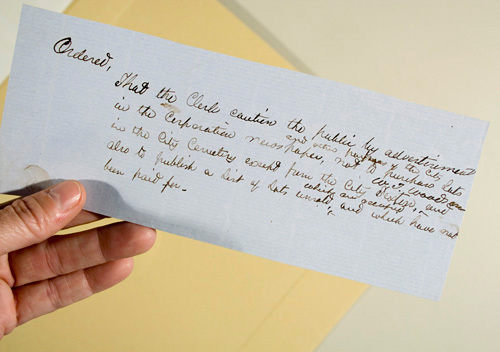 In 1854, citizens began complaining of the practice of indivuals who were dumping dead animals and raw sewage at the northern edge of the City Cemetery. The following two documents detail the plea and response by the city officials. An ordinance was enacted to bury dead animals, and other disagreeable matter in the city-owned lakefront grounds between today's Diversey and Fullerton Parkways. The undersigned respectfully represent that persons unknown to them are in the habit of depositing dead animals, night soil and other offensive matter around the North end of the Cemetery grounds to the great annoyance of persons living or traveling in that vicinity and they respectfully ask your Honorable body to take such action in the premises as may be deemed advisable. They would suggest that the SE frct 1/4 of Sec 28, T.40 R 14. belonging to the City be designated as the proper place for depositing such matter and that the practice making such deposits be compelled to bury them. Ordered that the city Marshall prosecute all persons who shall Deposit or cause to be Deposited any putrid or offensive substance Dead animals or other unwholesome matter of any kind Contrary to the ordinances of the City. and that the health officers cause to be removed or buried all Nuisance or nuisances that now exist adjacent to the Chicago Cemetery on any part of Said City that may come to his Knowledge hereafter.